What on Earth is Financial Geography? Is not financial geography an oxymoron? Why should geographers, naturally interested in travel, outdoors, breathing fresh air while doing fieldwork be interested in money, taxes, assets and liabilities? If you were interested in these things, would not you become an economist or at least an accountant rather than geographer? 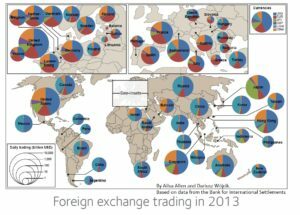 Take a look at the map showing foreign exchange trading. The first striking feature is the scale of this financial activity. Currencies worth over 5trn USD are traded daily, compared to foreign trade in all goods and services of 7trn USD annually. This is how financialised the world economy is. The second thing you may notice is the dominance of navy blue representing USD, the hegemonic currency. The Chinese currency is nowhere to be seen, not yet. Even a simple map like this can be a starting point for a discussion on political economy and geopolitics. This simple map also illustrates a more general point. Geography is fundamental to understanding finance and vice versa. Finance is one of the most globalised and networked of human activities. Financial centres as nodes in these networks epitomise modern capitalism. Just as pyramids symbolise ancient Egypt and late Middle Ages are associated with gothic cathedrals, skyscrapers filled with financial and related professionals will for posterity symbolize 20th century capitalism. As Gordon Clark, one of the pioneers of financial geography, puts it, money flows like mercury. It penetrates every nook and cranny of the global economy, changing social and political relations. Geoffrey Ingham, a sociologist, stated that along writing and number, money is one of our essential social technologies. Over one hundred years ago, Max Weber characterized money as a weapon in the struggle for economic existence. However, finance is still poorly understood in economics and social sciences. Mainstream economists live in the Neverland where space does not matter to finance and finance matters little to economic development. The view of finance in economics became as detached from the social reality of finance, as some financial practices, for example tens of USD trillions worth of derivatives traded mainly among banks, became detached from society. Social scientists in turn neglected money and finance assuming it was taken care of by economists. This failure of scientists to understand finance, highlighted by the global financial crisis, represents an opportunity. With the subprime crisis, the Eurozone crisis, Brexit, as well as new financial technology threatening to transform finance, the map of the financial world is in a state of turmoil, with major implications for development. Geography is well-positioned to take advantage of this opportunity, because of its open mixed-methods approach. Studying the significance of location, place, space, territory and scale in finance is crucial for advancing knowledge and public policy. It could also be a way to rally social sciences around the questions of money and finance, and perhaps even a chance to contribute to a much-needed re-integration of social sciences. To do financial geography you have to be numerically literate, but you do not have to focus on quantitative research – it can be qualitative as well. Financial geography transcends the divisions of geography into its economic, political, social and cultural branches. It involves environmental geography too, as financial markets price commodities, and natural environment at present and into the future through insurance contracts, securities, and derivatives. There is a lot of work to be done, but I am optimistic. John Authers from Financial Times in a column featuring my research with Duncan MacDonald-Korth wrote “Investors have much to learn from academics, and certainly not just from economists. Now it is the turn of geographers”. Let us take courage from this example and use financial geography to bring finance back to planet Earth!